Explore the interactive map of Johannesburg South Africa in its different formats below.They not only show you the metropolitan area of greater Johannesburg and its district and local municipalities, but also of the whole of the Gauteng province, including the Coty of Tshwane and Pretoria. With the biggest economy in the Sub-Saharan part of Africa, Johannesburg is one of the forty largest sized metropolitan cities worldwide. Although it is not one of the three national capital cities of South Africa, it certainly is the powerhouse of South Africa's economy. Home to O.R. Tambo International Airport, busiest and largest airport in Africa, it is the main port of entry for international flights to and from the entire Southern Africa. According to the national census of 2007, the population number of Johannesburg city comes to 3,8 million and that of the more extensive Johannesburg Metropolitan Area to 7,1 million. If you add the Ekurhuleni, Soweto, West Rand and Lenasia regions, you look at a total population figure of 10,2 million. The City's land area is 1,645 km2 (635 sq miles), which gives us a population density figure 2,364/km2 (6,120/sq mile), which is low compared to other cities of similar size. The following instructions will help you navigate the interactive maps below with ease. The map below shows you the location of the city of Johannesburg and Gauteng Province within the republic of South Africa. The first map below shows the boundaries of Gauteng Province and the location of the City of Johannesburg wthin the province. 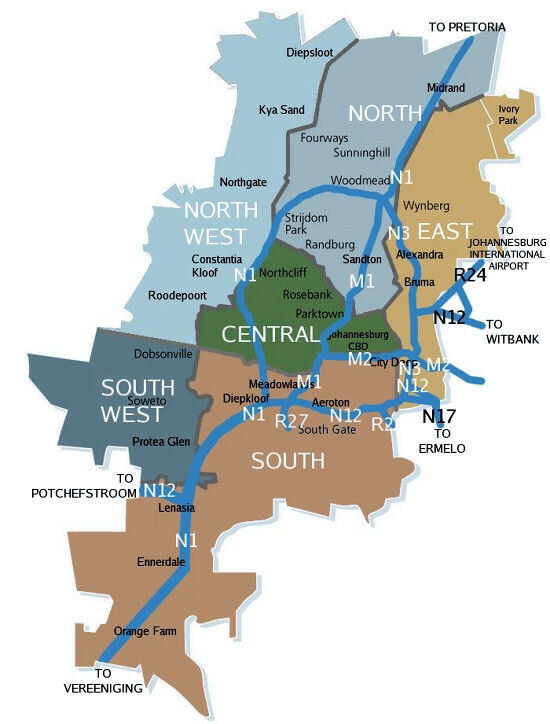 The second one is a static map showing how Gauteng Province has been divided into its municipal areas, including the main highway arteries. 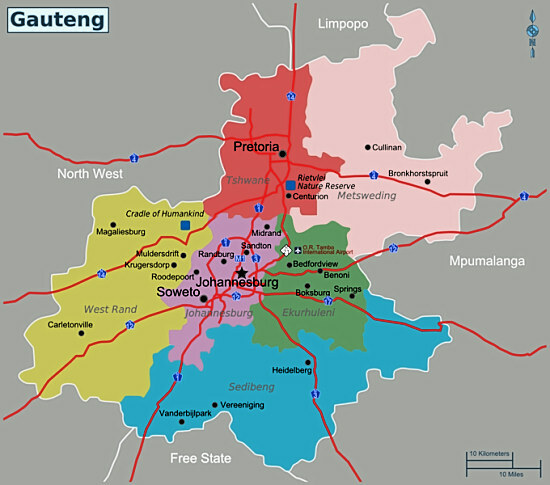 The first one of the following two map shows how Gauteng basically consists of two metropolitan areas, the City of Tshwane metropolitan area which includes Pretoria and the City of Johannesburg metropolitan area. 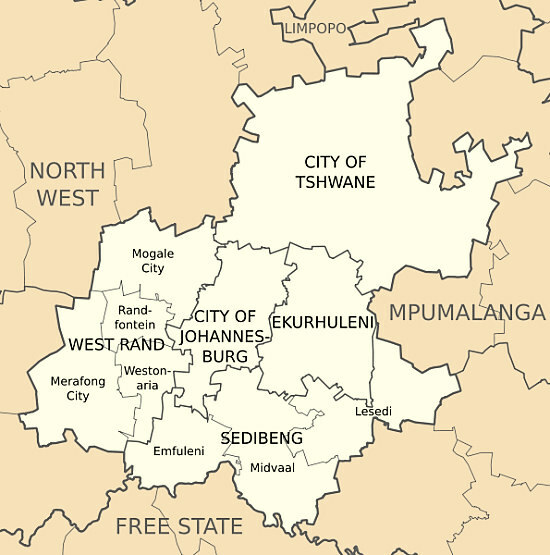 The second one shows the municipal boundaries of the City of Johannesburg and its suburban areas, including the highway arteries cutting through it. The last two maps are both interactive, the first one showing the Johannesburg metropolitan area and the second one showing the central part of the Johannesburg municipal area. For easy navigation, check the instructions at the beginning of this Page.